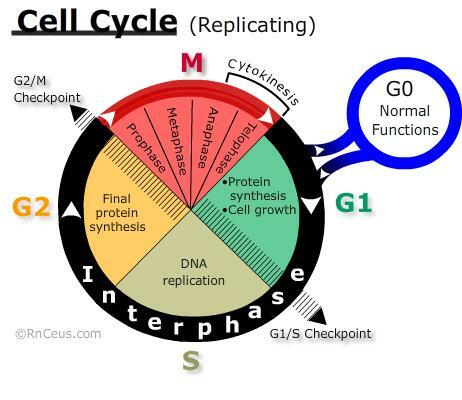 Normal cells and abnormal (cancer) cells must complete the cell cycle in order to replicate. The cell cycle is an ordered sequence of cellular events regulated by chemical signals produced by genes. Some genes (proto-oncogenes) are responsible for stimulating cellular growth and division. Other genes (tumor suppressor genes) restrict cell cycle progression. In many cases, genetic damage causes cancer cells to lose their ability to produce or respond to the products of tumor suppressor genes. Such cells may embark on an uninhibited cycle of cell replication. Improved understanding of the cell cycle has allowed researchers to develop treatments that can inhibit each specific phase in the cycle and in some cases cause cells to self-destruct (apoptosis). The CELL CYCLE diagram on the right depicts major landmarks on a cells journey to replication. Traditionally the eukaryotic cell cycle is divided into two alternating states; interphase and Mitosis. Shortly after mitosis, internal and external factors determine one of two outcomes for each daughter cell: rest or proliferation (replication). Resting cells are considered to be outside of the proliferative cell cycle. Resting cells include two groups. The first group is differentiated cells that carry out all the normal functions of their cell type but do not engage in the activities required for proliferation. The second group, (e.g., stem cells) may be induced to differentiate or proliferate. Proliferating cells are those engaged in activities of replication. If they complete all phases of the cell cycle from G1 to mitosis the result is two daughter cells. Interphase is the part of the cell cycle that produces the intracellular elements necessary for mitosis. During interphase (G1, S, G2), progression from one phase to another is regulated by phase specific expression of pro-proliferative cyclins and their cyclin-dependent kinases (CDK) and anti-proliferative tumor suppressor proteins that inhibit the cell cycle. Interphase contains several checkpoints that ensure that the cell is competent to complete mitosis. If the cell does not meet the molecular and biologic requirements of a checkpoint, it may not progress beyond the checkpoint. Cells that are blocked at a checkpoint may be triggered to enter apoptosis. (GO)  In this "resting" phase, cells are carrying out their normal metabolic functions. They are not replicating and therefore not in cell cycle. Depending on the type of cell, this period can last for a few hours or until the cell dies. Some cells like terminally differentiated muscle cells and most nerve cells remain in G0 indefinitely. In the case of peripheral T-lymphocytes, most are in the G0 phase until they are induced to replicate by contact with an antigen presenting cell. When a G0 cell is signaled to replicate, it moves into the G1 phase. (G1)  During G1 phase, the cell responds to external signals such as growth factors by manufacturing of cytoplasmic contents and proteins need for two daughter cells. G1 cells do not progress to the S phase until the cell meets certain criteria. The G1 phase may last 6 or more hours. G1/S checkpoint restricts progression from G1 to S phase. The normal cell will remain in G1 phase until external growth factors and available nutrients induce sufficient production of activated (cyclin-D+cdk4&6) complexes to phosphorylate the tumor suppressor (retinoblastoma (Rb)) protein portion of the G1/S checkpoint. Removal of Rb inhibition commits the cell to the S phase (DNA systhesis). G1 phase-specific agents include: L-asparaginase and corticosteroids. Daughter DNA is replicated from each parent template DNA strand. Upon completion of the S phase, each chromosome is composed of two DNA double-helix molecules joined at a centromere, forming a chromatid. The S phase lasts about 8 hours. S phase-specific agents include: azacitidine, cytarabine, decitabine, doxorubicin, fludarabine, 5-fluorouracil, gemcitabine, hydroxyurea, mercaptopurine. methotrexate, procarbazine, thioguanine. Mitosis (M)  Mitosis is the biological sum of four phases: Prophase, Metaphase, Anaphase and Telophase. When mitosis is complete, genetically equivalent chromosomes exists at opposing poles of the cell. Cytokenisis divides the mother cell into two daughter cells. The M phase usually lasts about one hour. Many chemotherapy agents are cell cycle specific (CCS) drugs that exert their major cytotoxic effect during a specific phase of proliferation. Typically CCS drugs have less effect on cells in the resting state (GO). CCS drugs are administered in the minimum effective concentration via continuous dosing methods rather bolus to maximize the time exposure of cells within the continuum of the targeted phase. Cell cycle non-specific (CCNS) drugs like cyclophosphamide or platinum based cisplatin act against cells in all phase of the cell cycle, including the GO or resting phase. CCNS drugs are dose dependent (>dose = >kill rate). They are most effective and least toxic when given in high dose bolus. Large solid tumors with a greater fraction of cells in resting cells may be treated more effectively by CCNS agents. Leave RnCeus.com to check out this YouTube video The Cell Cycle for in depth explanations, and a graphic showing the relationship of the phases to one another. During which phase is DNA replicated? Cell kill theory proposes that a set percentage of cells are killed with each dose of chemotherapy. The percentage of cells killed depends on the specific drugs used. For example, if a tumor has 1,000,000 cells and is exposed to a drug that has a 80% tumor cell kill rate, the first chemotherapy dose will kill 80% or 800,000 of the cancer cells. The second dose will kill another 80% of the cells remaining. Because only a percentage of cells die with each exposure to a cytotoxic agent, additional doses of chemotherapy must be repeated to reduce the cancer cells to just a few remaining cells. When only a few cancer cells remain, it is hoped that the bodys immune response will then kill the final cells. Cell cycle time refers to the amount of time required for a cell to move from one mitosis or cell division to another mitosis. The length of the total cell cycle varies with the specific type of cell. How long a cell is in the GO or resting phase is the major factor in the cell cycle time. The growth fraction of tumor refers to the percentage of cells engaged in proliferation versus G0 phases at any given point in time. Tumor burden refers to the number of cancer cells present in the tumor. Cancers with a small tumor burden are usually more sensitive to cytotoxic therapy because they have a high number of cells reproducing. As the tumor burden increases, the growth rate slows, and the numbers of cells actively dividing slows down. the ability to metastasize to other organs and tissues. The cell kill theory proposes that a set percentage of cells are killed with each dose of chemotherapy. Cancers with a small tumor burden are more sensitive to cytotoxic drugs than tumors with a large number of cells.